Well known for its breath-taking coastline, Whitehead has set up a new rowing club, ready to ride the waves of the Antrim Coast. Members of Whitehead Coastal Rowing Club had been operating out of the Yacht Club since 2017 but are now embarking on a new voyage themselves as a standalone club. With stunning views stretching as far as Scotland, it’s easy to see why the new club already has over 30 members ready to take to the open water. Part of the Antrim Coastal Rowing Association, it’s the fourth club in the Antrim area. It meets 2-3 times a week, with a variety of levels, from racers to casual rowers. Lenny Entwistle is the club chair: “Whitehead Coastal Rowing Club is an exciting new cross-community venture bringing the sport of coastal rowing back to Whitehead bay. Rowing is an excellent entry level method of getting people on the water, where they will enjoy making new friends and at the same time improve their health and wellbeing. We welcome all abilities and even have a guide dog Quaker as a member who accompanies keen rower Terry Hopkins. The club is over 18s at the moment but are hoping to start a junior section in the coming months, and welcome anyone with experience to come and help out. They will also be fundraising for boats in the coming weeks as they are currently borrowing from other local clubs. 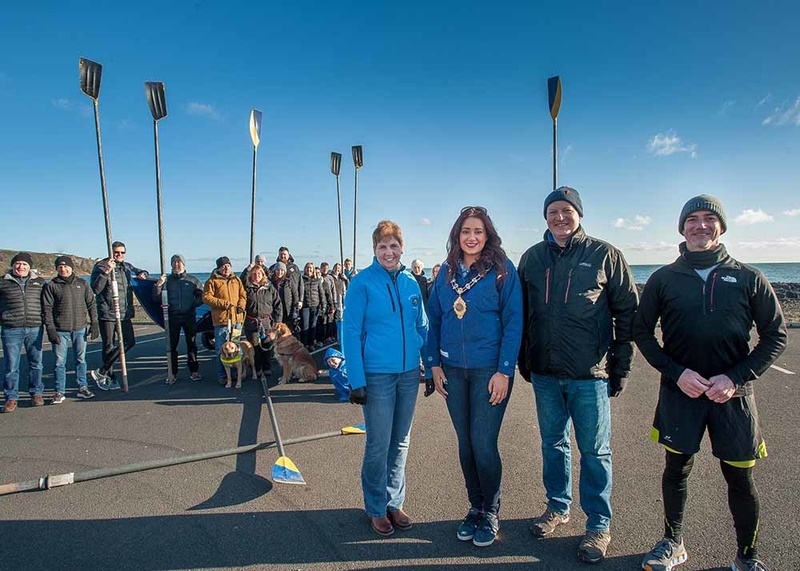 Mayor of Mid and East Antrim Cllr Lindsay Millar said: “Rowing is a great way to keep fit, get some fresh air, or clear the head after a stressful day. The water hereis among the best in the world, from Whitehead Bay, the lighthouse, to the Cloughan Jetty, what better opportunity to take in the gorgeous scenery here.